Launched some three months ago, the new EF 50mm f1.8 STM replaces the previous Mark II model, and although it is still intended as an entry-level prime, it features a number of enhancements over its cost-conscious predecessor. With a total of 6 elements arranged in 5 groups, the optical formulae of the two models remains unchanged. The new better-made version, however, focuses closer down — from 17.8” (45cm) to 13.78” (35cm), has improved coatings, and features a circular 7-bladed aperture. It also includes a stepper (STM)-type motor for quieter and smoother AF, a particularly useful addition for video-enabled DSLRs. With a wider focus ring, the external appearance now resembles other recent non-L series models, but like its Mark II predecessor, the new version still lacks the focus distance window and markings found on other EF models in the lineup. 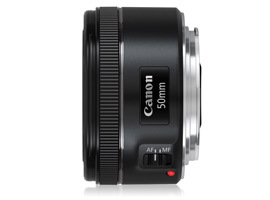 The new lens has a smaller a 49mm accessory (down from 52mm), measures 1.54 x 2.72” (39 x 69mm), and weighs 0.35 lb (159g). It is available now at around $129 (USD). 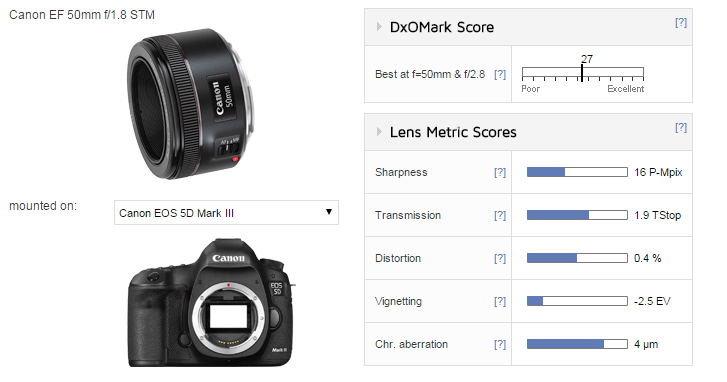 With a DxO Mark lens score of 27 points on the 22-Mpix Canon EOS 5D Mk III, the EF 50mm f1.8 STM is optically very good. 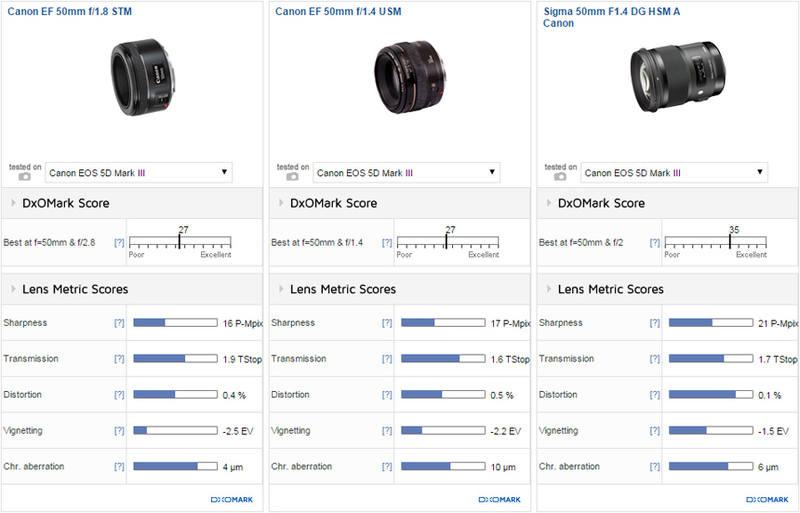 With a 16 P-Mpix score, peak sharpness is achieved at f/4, although optimum performance across the field is reached at f/5.6. 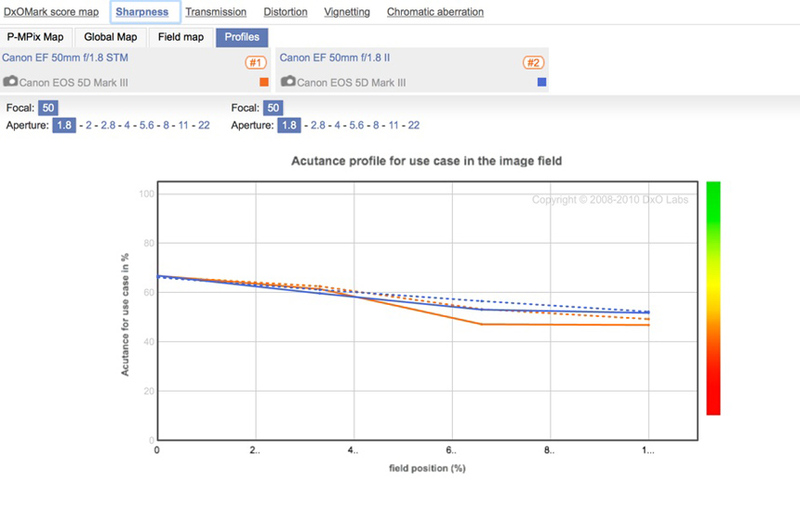 Open-aperture performance is good centrally to around the 30% field position, but edge performance is really only average. 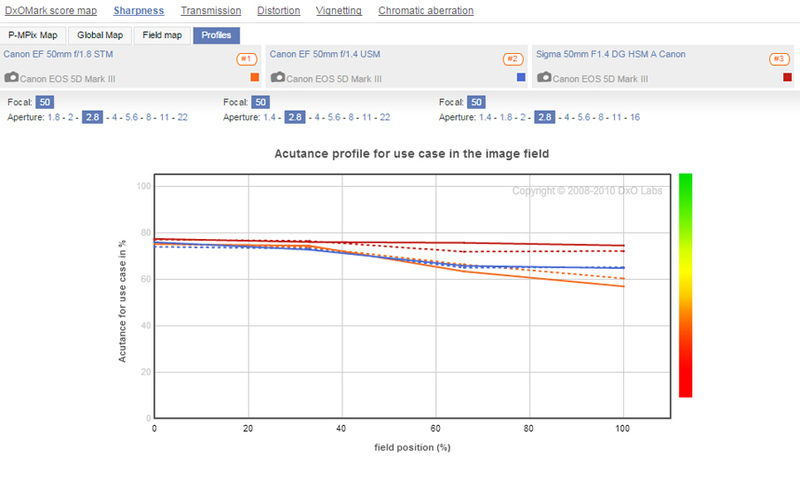 However, it improves dramatically upon stopping down to f/2.8 and then increases thereafter, more or less matching the center by f/11 (albeit with a decline in sharpness across the field). Transmission and suppression of lateral chromatic aberration are both impressive, but vignetting at –2.5Ev is higher than expected. Given that the two share the same optics, it is unsurprising that against its predecessor, the new model performs very similarly. 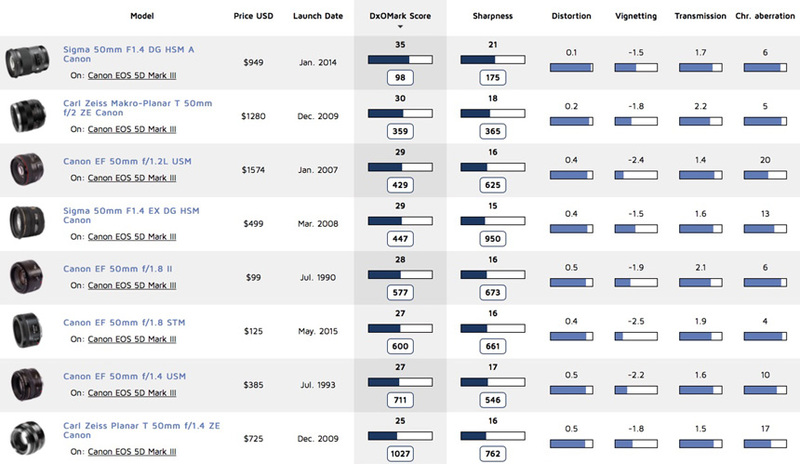 However, there are few measurable differences in the lab tests. First, the new lens has slightly higher vignetting, though that’s really only noticeable in the extreme corners, where it peaks at –2.5 Ev. In terms of sharpness, the new model more or less mimics that of the Mark II, only at wider apertures there’s some slight loss of acutance. 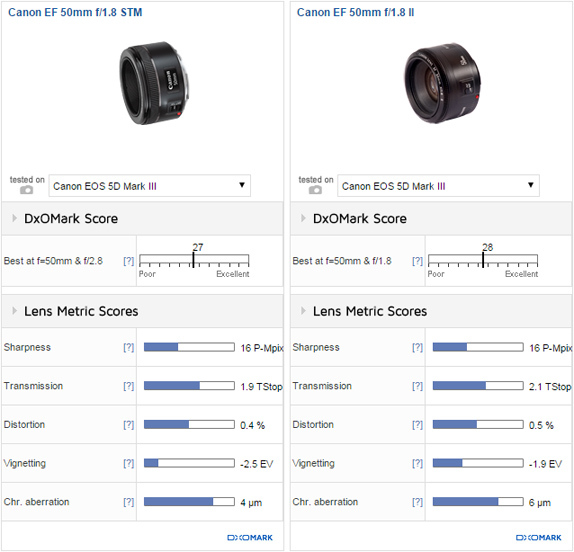 On the plus side, Canon has been able to improve transmission, lower distortion slightly, and lower chromatic aberration from an already low maximum of 6 microns to just 4. 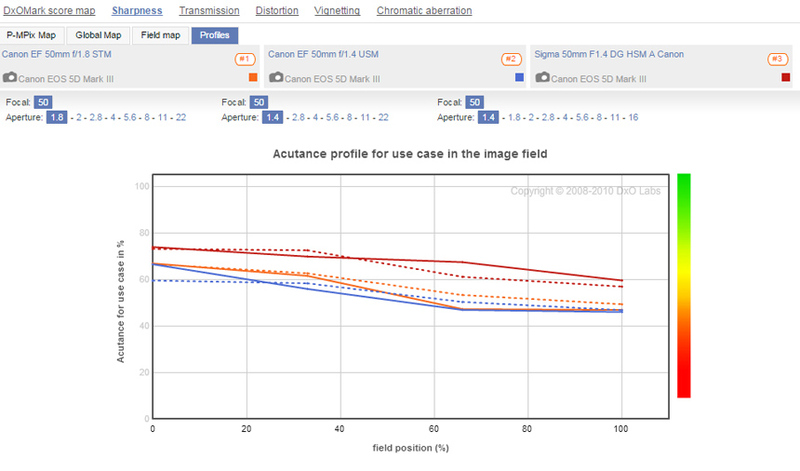 Some slight lowering of acutance is measurable in the outer field at wider apertures. Although the Canon 50mm f/1.8 is considered an entry-level model and doesn’t quite match the Nikon AFS Nikkor 50mm f/1.8G in terms of market positioning, the new Canon largely keeps pace with Nikon’s f/1.4 model. Like the Mark II, it is an old design from the days of film, but it is still a formidable performer, at least optically. As an older f/1.4 model, it has higher distortion and chromatic aberration, particularly when wide open, and it might not match the newer (and pricier) Sigma 50mm f/1.4 Art series at wider apertures (in terms of sharpness or uniformity across the field), but it’s no slouch. All three models have similar center sharpness by f/2.8, and it’s only the Sigma that has superior sharpness in the outer field. Still, at just $129, the Canon 50mm f1.8 STM performs very well indeed. Wide open, there’s no doubt the Sigma is the superior lens, but the new Canon model is a very competent performer. Stopped to f/2.8, the new Canon rivals the Sigma and Canon f1.4 models, at least in the center. After revamping the original Mark I version with a noticeably lower build, including a plastic mount and no AF distance scale, the EF 50mm f1/.8 Mark II model really didn’t add Canon anything to its reputation as a premium lens maker. It had one redeeming quality, though: its image quality was really very good. The new STM version doesn’t quite match the recently-updated Nikon AFS Nikkor 50mm f1/.8G in its aspirations or price (the Nikkor is available now for around $220); however, Canon has enhanced the look and feel and replaced the old micro-motor with a stepper type. Best of all, the image quality is practically identical and at $129, it remains a steal.